Back in 2015 I received, totally out of the blue, 2 separate deliveries from an amateur puzzle designer and craftsman called Carsten Elsäßer. 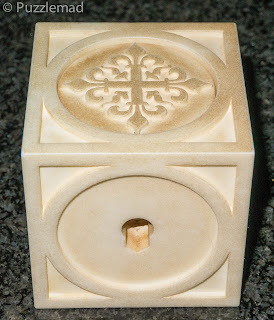 In March I really enjoyed his 2 Piece cube and marvelled at the craftsmanship which not only was of wood but included some very nicely made metal components which really takes some skill for an amateur to create. The whole idea was very clever and nicely implemented with a great Aha! moment. 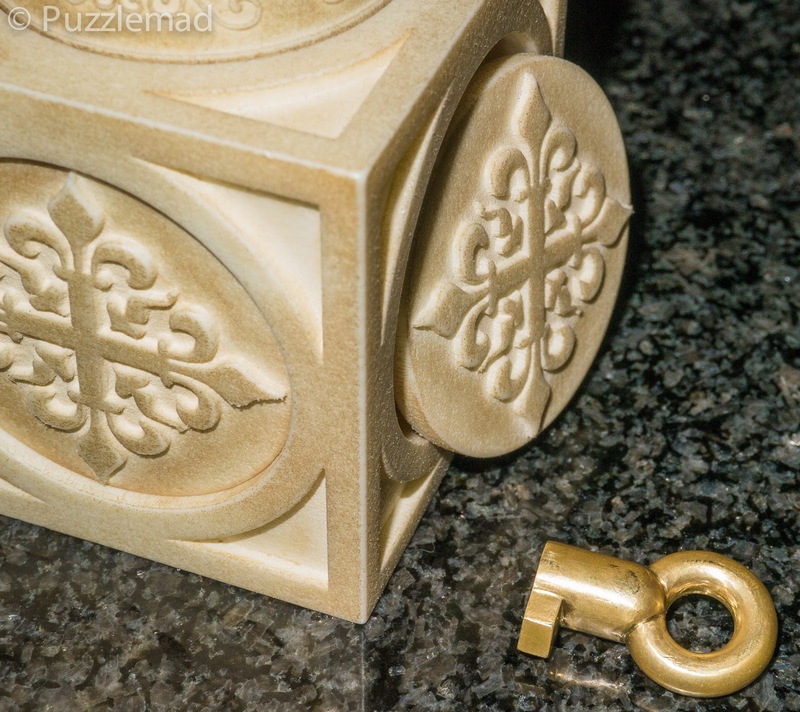 Then in August he completely blew me away with a mostly metal construction called the Naga puzzle which was a sequential discovery puzzle of similar scope and wonder to the limited edition puzzles made by the great Brian Young. A truly amazing thing also is that Carsten spends most of his time living and working aboard a cruise ship travelling all over the world! This gives him very little time at home to actually manufacture his puzzles. I had communicated with Carsten earlier this year and was aware that he was busily designing away but, to be honest, I had totally forgotten about it. Then out of the blue earlier this month he asked for my address again and sent me another lovely new toy through the post. To make this even more incredible, he has become a father for the first time just a month ago and still managed to work on a fabulous new puzzle! Congratulations my friend! You are amazing! 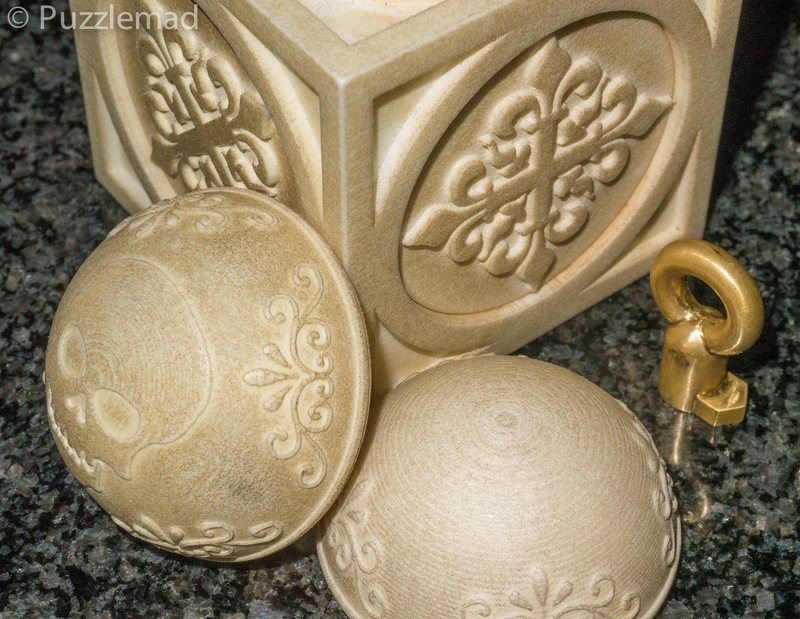 Helping with the development of this puzzle Carsten has discovered the amazing capabilities of 3D printing. 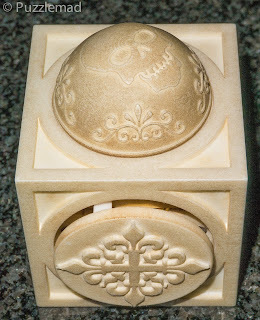 The Pirate's casket is made from sintered nylon and has many magnets. It is also one of the first times I have ever come across a puzzle pade with 3D printed metal components too. 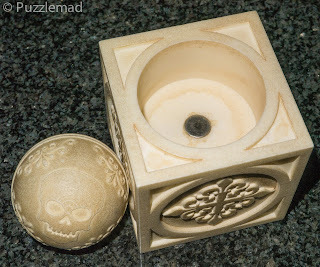 The pirate's casket was found after centuries at the bottom of the ocean.....OK it's nylon so maybe it wasn't! But it has been aged to look like it has - apparently judicious use of coffee and charcoal has given it the "bottom of the sea" look. 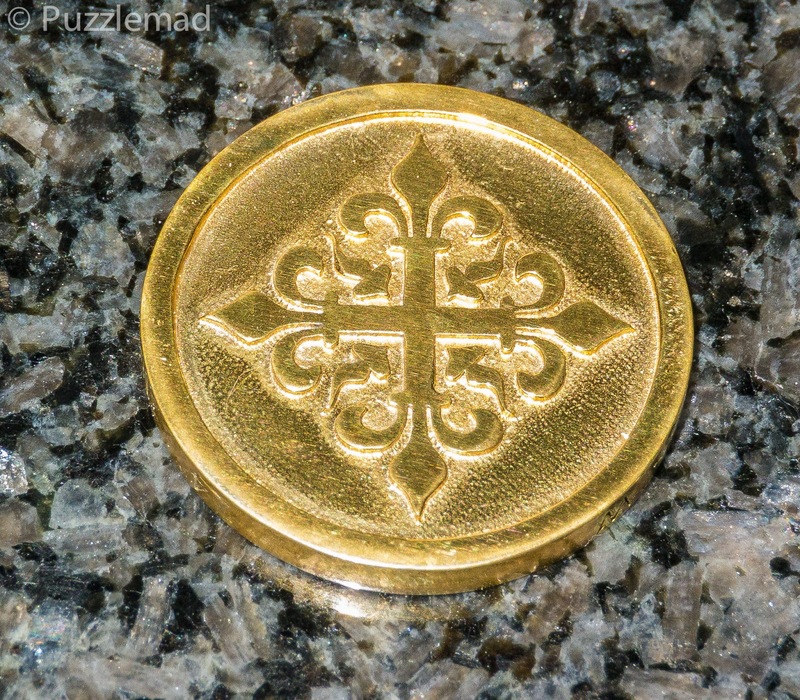 The aim of this puzzle is firstly to find the gold coin inside and then as a secondary challenge I have to establish which pirate it belonged to. YES!!!! I lurve sequential discovery puzzles! I was told that it is strong enough to resist a bit of abuse but banging and prying at it is entirely unnecessary. The puzzle is surprisingly weighty for a plastic printed puzzle - it feels like there is metal inside. 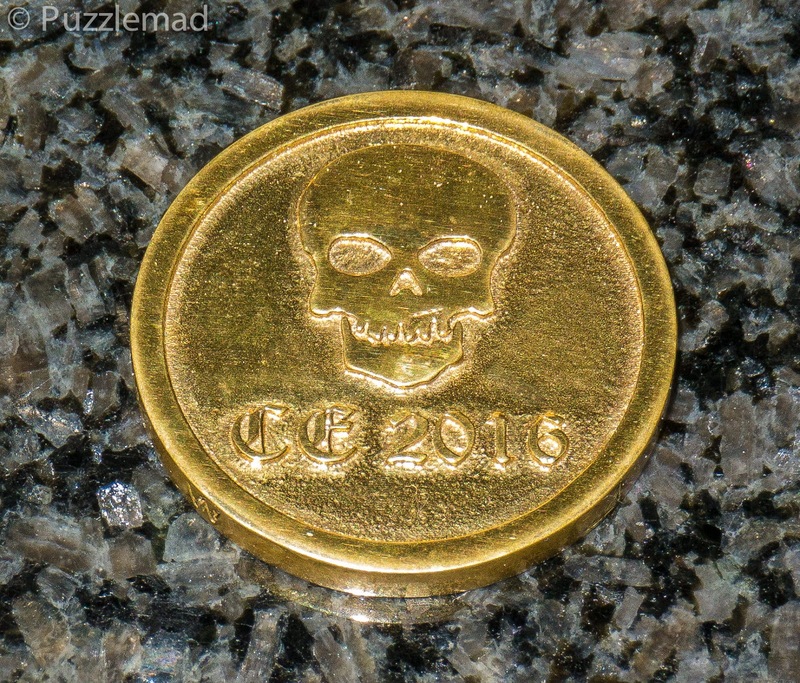 Maybe it's a gold doubloon? Time to explore....the ball on top rotates freely but has a tendency to ping into certain positions - if you hold a compass near this then the needle goes haywire all over the place! There seems to be magnets involved....LOTS of them! With a bit of a tug the ball will come out too. 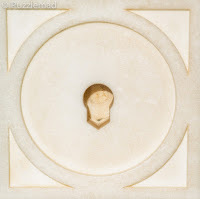 Underneath the casket there's a keyhole but no key...yet. 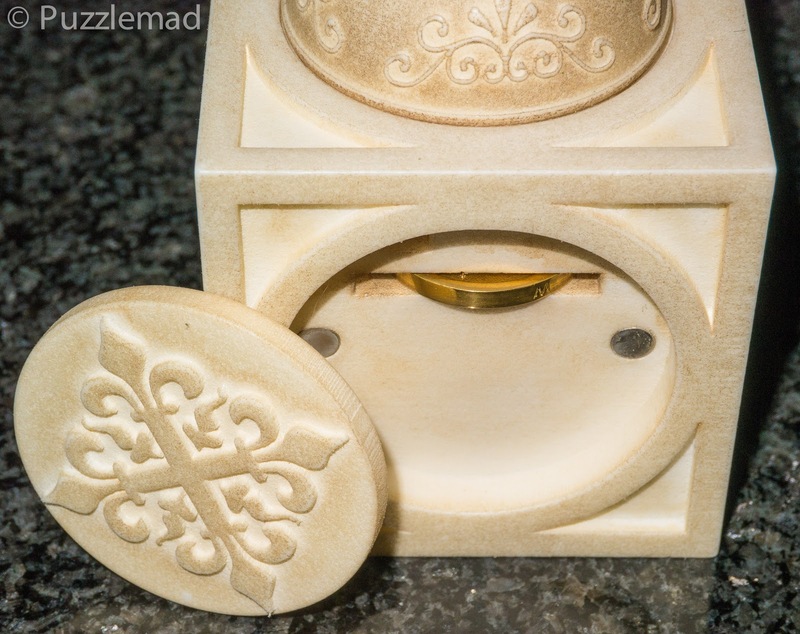 In fact, looking in the keyhole gives no clue of what's inside as there doesn't seem to be any way for the key to turn inside. It gets more and more intriguing. 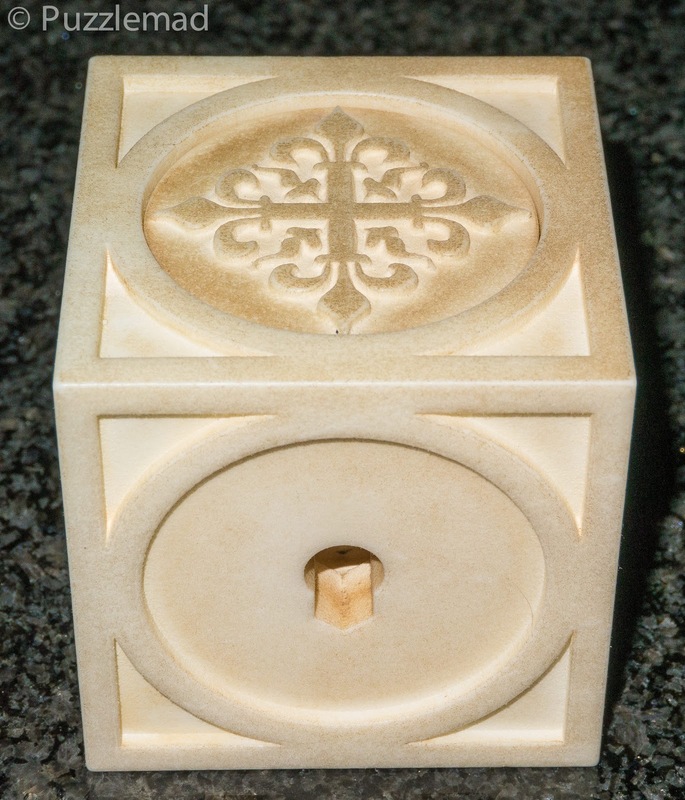 Obviously the next thing to try is look closer at the panels on the faces of the casket. They appear to rotate fairly freely but in 45º increments they click into place. Try this with each in turn and aha! One won't move at all! Explore, explore, explore. My usual is to move things over and over again in the hope that one day I will prove Einstein wrong. Of course that is not the correct thing to do but I do find it therapeutic. OK! Time to be more systematic....rotate each of the panels in turn and see what happens....nothing! Puzzles like this actually require a light touch and during my investigation something feels different and I'm not sure why. Back-track and Aha! again. A panel shifts slightly and seems to require a bit more. What if??? YES!!! I seem to have a key. A key has come out. I am told that the key has also been 3D printed! Incredible! I can hear you shouting at me...try it in the keyhole! These damned voices are really starting to worry me! 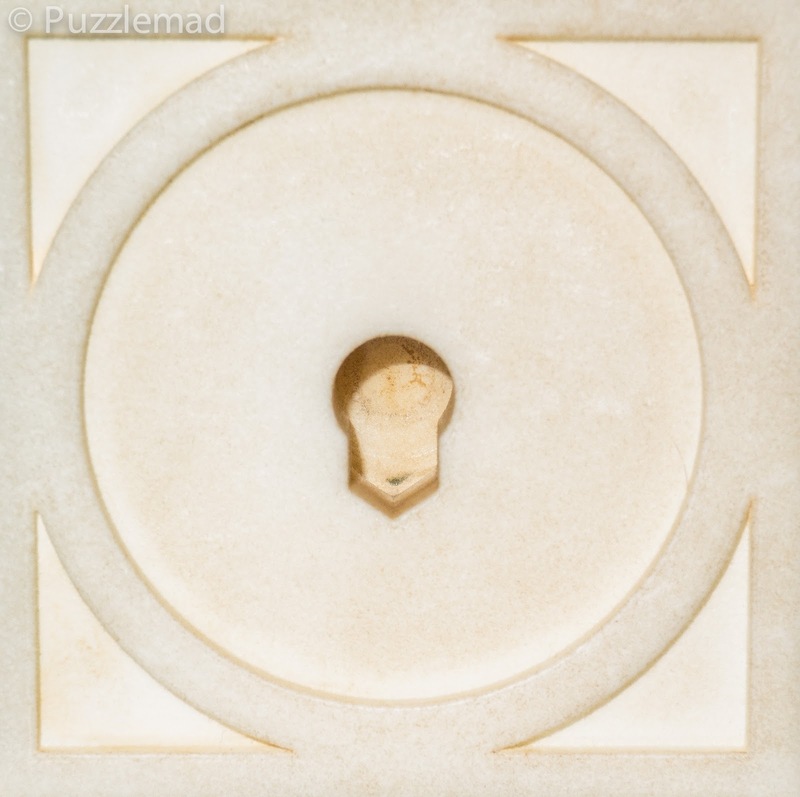 The key goes into the keyhole perfectly and..... well you know that NEVER works in the puzzling world. My friend Shane keeps sending me puzzles with keys and so far I don't think any of them have done anything. 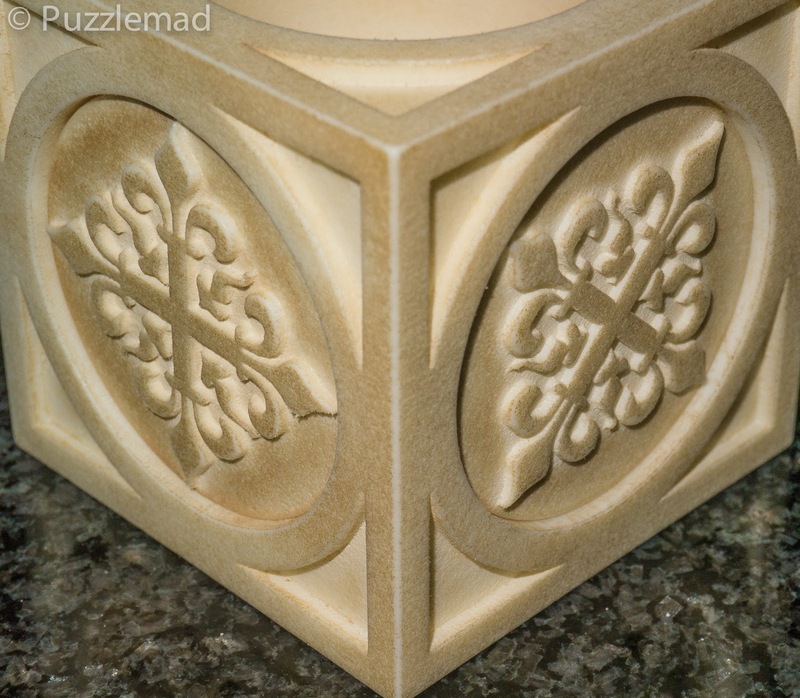 Puzzle designers are nasty that way - they raise your hopes and dash them. I give up on the keyhole and notice that the key is held inside fairly firmly. Interestingly there is another magnet stuck inside the key itself. Maybe the key has other uses? 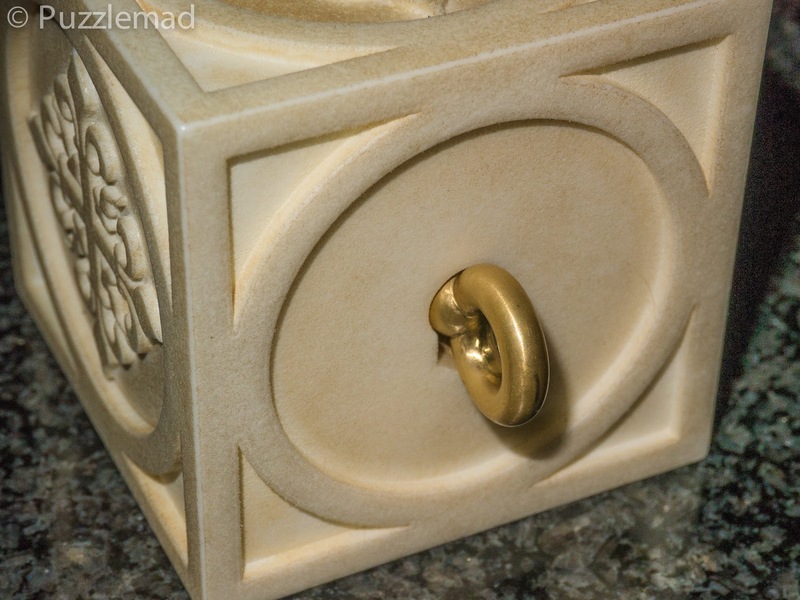 I am aware that there are rather a lot of magnets in the casket as floating the key over various parts makes pushing and pulling motions all over the place. I proceed to go round and round in circles for a while and get nowhere. I do make a useful discovery during my further exploration but at this stage it doesn't help me at all. Interestingly moving the key over the ball makes exciting clicking noises and something rather heavy moves around inside it. I have a brainwave which as always doesn't work and give up for the day. After a couple of evenings of attempts my main thought doesn't seem to be working so I contact Carsten for a clue. As a Dad of a new baby, I suspect he doesn't get out very much just now and he replies very quickly. My thoughts had been nearly right and his very teeny tiny hint got me my next step. I think I am almost there! 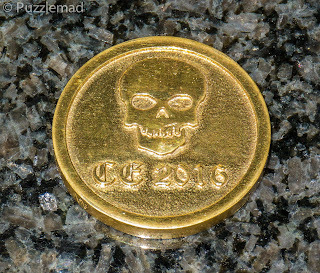 It has taken me 4 evenings of gentle play and discovery and I finally have found the pirate's coin. 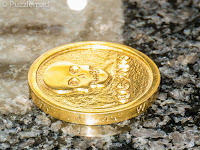 I don't think it is a doubloon or even gold but 3D printing makes for a very nice and beautifully detailed momento. 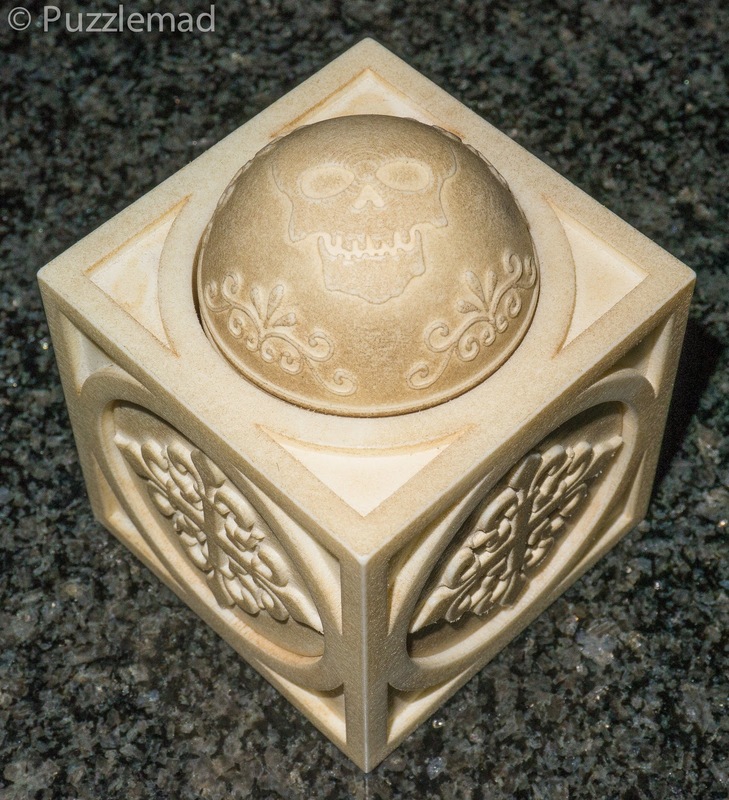 What about the final piece of the quest? Finding out who was the original owner of the casket? This takes good eyesight, some GoogleFu and a bit of reading. I learned there are things you can look up on the internet with only very tiny pieces of information. 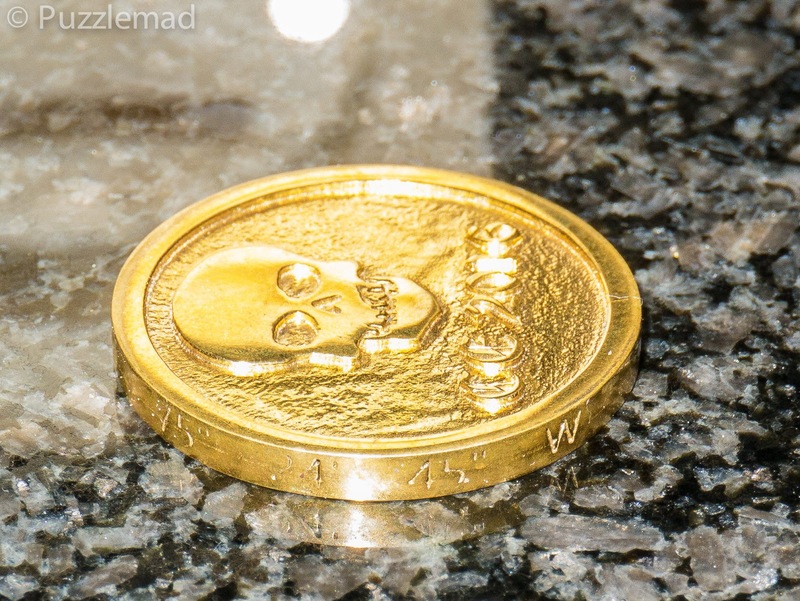 It would appear that Captain Arthur Catt may have been a very wealthy man before he lost his 3D printed coin and chest in an ocean with coffee in it! 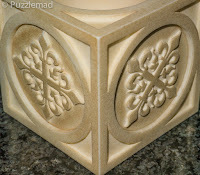 This puzzle has been nearly 2 years in the design and manufacture - it is truly wonderful! Yet again, I am aghast at the incredible skills and design ability of Carsten Elsäßer whilst he spends half his life at sea and also finishing off with a newborn in the house. Thank you so much my friend, I will be bringing this to a Midlands Puzzle Party in the 2018 to let the guys have a play. I am sure that they will solve it quicker than me but will still greatly enjoy it. 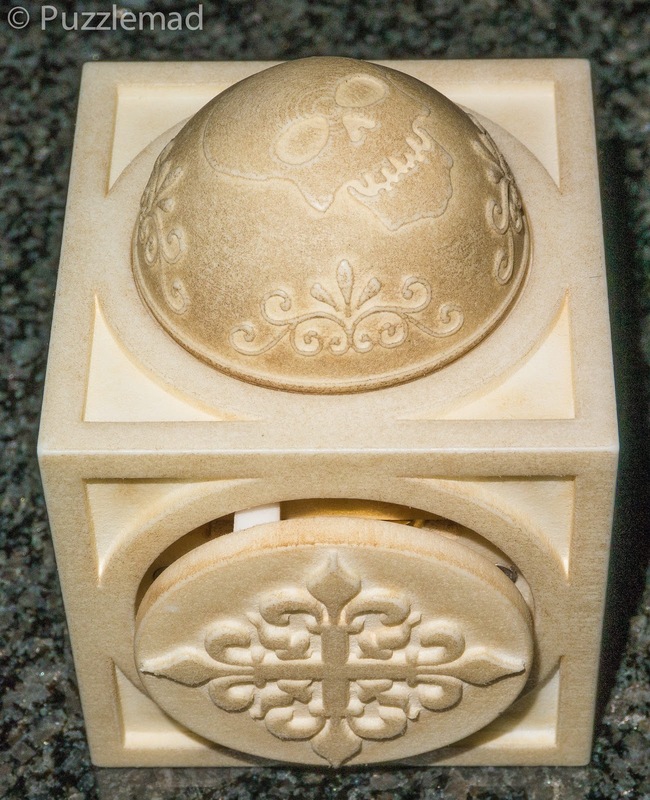 "These damned voices are really starting to worry me..." You know Kevin, those voices may have simply been the pirates ghost demanding that you find and return his 3D printed coffee-stained doubloon back to him :D.
You might be right! But I’ve been hearing the voices for much longer than I’ve had this puzzle! Sometimes I wonder whether I’m sane but I guess if you can wonder about your own sanity then you must be sane......or at least that’s what the voices say!